Donate ~ Adopt-a-Soldier Platoon, Inc.
Show our brave men and women their service is appreciated. Your donations will improve the morale of our Troops. In 2017, 95.1% of all our revenue went to our programs. We are consistently in the 95+% range. And ... we are all volunteers and have minimal expenses. We are licensed to solicit donations in the State of New Jersey and Commonwealth of Massachusetts. Thank you. Care packages - we can always use great items. Thanks to some great Benefactors, our stock of items is getting better and bigger! 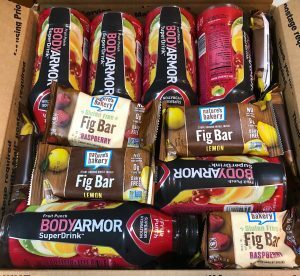 The latest fabulous donations include Body Armor super-hydration fruit drinks from Keurig/Dr Pepper and fig bars from Nature's Bakery. The upcoming packing events will be great fun and really appreciated overseas!